Figure 1. 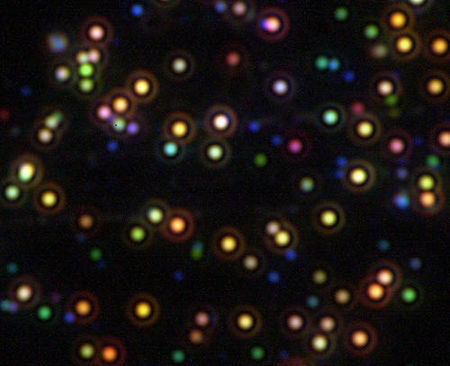 Dark-field micrograph of wavelength selective scattering from silver nanoparticles (http://www.westga.edu/~chem/facultydocs/stuart.htm). In 1893, the antibacterial effectiveness of various metals were noted and this property was named the oligodynamic effect. It was later found that out of all the metals with antimicrobial properties, silver has the most effective antibacterial action and the least toxicity to animal cells (Guggenbichler et al., 1999). Silver became commonly used in medical treatments, such as those of wounded soldiers in World War I, to deter microbial growth (Saltlakemetals.com). Once antibiotics were discovered, the use of silver as a bactericidal agent decreased. However, with the discovery of antibiotics came the emergence of antibiotic-resistant strains such as CA-MRSA and HA-MRSA, the flesh-eating bacteria. Due to increasing antibiotic resistance, there has recently been a renewed interest in using silver as an antibacterial agent. The availability of new laboratory technologies such as radioactive isotopes and electron microscopy has greatly enabled us to investigate the antibacterial mechanism of silver in recent years (Fox and Modak, 1974; Feng et al., 2000). Figure 2. Protein expression is downregulated when bacteria are exposed to Ag+. Shown are 2-D polyacrylamide gel electrophoresis protein patterns obtained from suspensions of E. coli after reactions with 0 ppb and 900 ppb Ag+ solutions for 3 h. Some spots indicate decreased amounts of protein expression after reaction with a 900 ppb solution, compared to results after reaction with a 0 ppb solution. Four spots with a decrease to less than one-third of the original amount are marked with open circles. The circled spots were cut out from the gel and analyzed with MALDI-TOF mass spectrometry. The probable identity of the proteins represented by the circled spots were determined by the NCBI and Swiss-Prot databases. Fructose-bisphosphate adolase was identified as another possible downregulated protein through this same process (not shown on this gel). The identity of the protein marked “Hypothetical protein” could not be determined through protein databases (Yamanaka et al., 2005). Figure 3. Treatment of cells with Ag+ results in DNA condensation, cell wall damage, and silver granule formation. 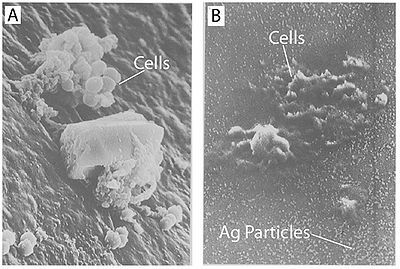 (A) E. coli and (B) S. aureus cells with and without Ag+ treatment were observed with transmission electron microscopy (Feng et al., 2000). Figure 4. Treatment with silver leads to dehydration of microbial cells. A)Staphylococcus aureus without silver treatment as found on a catheter. B)Staphylococcus aureus on a silver-containing material with microdispersed silver particles throughout the matrix. Both images were captured using scanning electron microscopy. Notice the shrunken appearance of the cells (Guggenbichler et al., 1999). Figure 5. Structure of silver sulfadiazine. Figure 6. Percent completion of reactions of various silver compounds with human serum. Human serum was incubated with 10 µmol of each silver salt. At the intervals designated, portions were removed and centrifuged, and the clear supernatants were analyzed to determine the amount of unreacted silver compound. The amount of compound used was taken on 100% (Fox and Modak, 1974). The silver-catalyzed formation of disulfide bonds can lead to changes in protein structure and the inactivation of key enzymes, such as those needed for cellular respiration (Davies and Etris, 1997). 30S ribosomal subunit protein, succinyl coenzyme A synthetase, maltose transporter (MalK), and fructose bisphosphate adolase were identified with high probability as proteins with decreased expression once cells are treated with a 900 ppb Ag+ solution (Yamanaka et al., 2005; Figure 2). It is hypothesized that silver ions bind to the 30S ribosomal subunit, deactivating the ribosome complex and preventing translation of proteins (Yamanaka et al., 2005). The proteins that were found to be downregulated upon treatment with Ag+ serve important functions to the cell: succinyl-coenzyme A synthetase, an enzyme involved in the TCA cycle, catalyzes the conversion of succinyl-CoA to succinate while phosphorylating ADP to produce ATP (Slonczewski and Foster, 2009); fructose bisphosphate adolase is an enzyme involved in glycolysis that catalyzes the breakdown of fructose-1,6-bisphosphate into glyceraldehydes 3-phosphate and dihydroxyacetone phosphate (Slonczewski and Foster, 2009); MalK is a cytoplasmic membrane-associated protein involved in the transport of maltose (Bavoil et al., 1980). In one way or another, all of these proteins play a role in energy and ATP production for the cell, so the decreased expression of any one of these proteins could lead to cell death (Yamanaka et al., 2005). Another one of the suggested mechanisms of the antimicrobial activity of silver was proposed by Klueh et al., (2000). It was proposed that Ag+ enters the cell and intercalates between the purine and pyrimidine base pairs disrupting the hydrogen bonding between the two anti-parallel strands and denaturing the DNA molecule (Klueh et al., 2000). Although this has yet to be proved, it has been shown that silver ions do associate with DNA once they enter the cell (Fox and Modak, 1974). Most of the proposed mechanisms involve silver entering the cell in order to cause damage. How would a metal like silver, or its ionized form Ag+, get across the hydrophobic cellular membrane to access the cytoplasm? From the perspective of a transmembrane protein, the silver ion simply appears to be a particle of certain size with a +1 charge. It is possible that silver ions get access to the interior of cells through transmembrane proteins that normally function to transport ions other than silver ions. Transmembrane proteins such as CopB-ATPase from Enterococcus hirae have been shown to be able to transport silver ions although its putative function is a copper transporter (Solioz and Odermatt, 1995). This proves that there are ways for silver to be transported across the cell membrane even though specific silver transporters may not exist. In order for silver to have any antimicrobial properties, it must be in its ionized form (Lok et al., 2007; Rai et al., 2009). Silver in its non-ionized form is inert (Guggenbichler et al., 1999), but contact with moisture leads to the release of silver ions (Radheshkumar and Munstedt, 2005). Thus, all forms of silver or silver containing compounds with observed antimicrobial properties are in one way or another sources of silver ions (Ag+); these silver ions may be incorporated into the substance and released slowly with time as with silver sulfadiazine, or the silver ions can come from ionizing the surface of a solid piece of silver as with silver nanoparticles. Feng et al. (2000) conducted a study to observe the effects of silver ions on gram-positive and gram-negative bacteria, namely Staphylococcus aureus and Escherichia coli. They treated cells with AgNO3, which is a source of Ag+ in aqueous environments, and looked at the structural and morphological effects of these silver ions on the cells. The cells were exposed to AgNO3 for 4-12 hours before being prepared for microscopy. 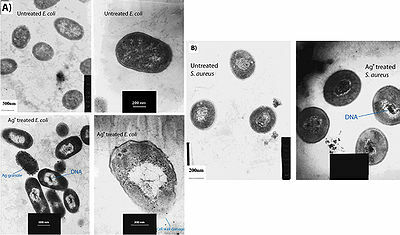 The cell were then fixed and sliced with an ultramicrotome to produce ultrathin sections for transmission electron microscopy (TEM). They observed that cells exposed to the Ag+ ions seemed to have activated a stress response that led to the condensation of DNA in the center of the cell. They also observed cell membrane detachment from the cell wall, cell wall damage, and electron dense granules outside and, in some instances, inside the cell (Figure 3). It was proposed that condensation of DNA occurred as a protective measure in order to protect the genetic information of the cell (Feng et al., 2000), however condensation of DNA could also prevent cell replication by preventing the DNA from being accessed by transcriptional enzymes such as DNA polymerase. The electron dense granules that formed inside and outside the cell were extracted and subjected to X-ray microanalysis to determine their composition. It was discovered that the granules were in part composed of silver and sulfur. This finding supports the idea that silver inactivates proteins by binding to sulfur-containing compounds (Klueh et al., 2000). It was also observed that when treated with Ag+, E. coli, a gram-negative bacterium, sustained more structural damages than the gram-positive S. aureus (Feng et al., 2000). It has also been shown that treating cells with silver leads to cell shrinkage and dehydration (Figure 4) (Guggenbichler et al., 1999). The TEM images from Feng et al. (2000) (Figure 4) show that cells that sustained extensive damage eventually ended up with cell wall and cell membrane damage. Damage to the cell membrane could lead to the leaking of cytoplasm from the cell, which would result in dehydrated and shrunken cells as shown by the SEM images from Guggenbichler et al. (1999). There are two explanations as to why gram-positive bacteria are less susceptible to Ag+ than gram-negative bacteria. The first involves the charge of peptidoglycan molecules in the bacterial cell wall. Gram-positive bacteria have more peptidoglycan than gram-negative bacteria because of their thicker cell walls, and because peptidoglycan is negatively charged and silver ions are positively charged, more silver may get trapped by peptidoglycan in gram-positive bacteria than in gram-negative bacteria (Kawahara et al., 2000). The decreased susceptibility of gram-positive bacteria can also simply be explained by the fact that the cell wall of gram-positive bacteria is thicker than that of gram-negative bacteria. Fox and Modak (1974) explored the mechanism of prevention of burn wound infections by silver sulfadiazine. At the time of publication, it had been known for quite a while that silver sulfadiazine (Figure 5) delivered in the form of a topical cream was effective at preventing infections in burn wounds, however it was not known if the antimicrobial activity was due entirely to the silver ions or if the sulfadiazine anion also contributed to the bactericidal effect. Tests from the study showed that sulfadiazine from silver sulfadiazine does not get transported into cells as much as silver. Silver isotopes (110Ag+) were also used to show that silver ions that enter cells complex with DNA. Additionally, the rate at which certain silver containing compounds release silver ions into solution was measured by adding silver compounds to human serum and measuring the amount of unreacted silver compound with increasing time (Figure 6). 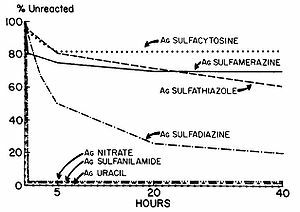 Notice in Figure 6 how silver sulfadiazine (Ag sulfadiazine) gradually releases the majority of its silver ions into solution over an extended period of time whereas silver nitrate immediately released all of its silver ions into solution (Fox and Modak, 1974). Therefore, silver sulfadiazine’s effectiveness as an antimicrobial agent for preventing burn wound infections is due to its tendency to dissociate in solution: silver sulfadiazine provides a steady supply of silver ions over a long period of time where as other silver salts such as silver nitrate release a large amount of silver ions all at once. If silver is employed as the primary antimicrobial agent in burn wound creams, the burn wound needs a steady supply of silver ions over a long period of time to kill off any microbes that could possibly infect the wound until it heals. Compounds that release silver ions all at once would need to be applied very frequently in order to kill off invading bacteria and prevent infection, and sometimes highly frequent application isn’t always practical or possible for individuals, so compounds that constantly release a bactericidal amount of silver ions, such as silver sulfadiazine, are the most effective at preventing burn wound infections. It has also been shown that when silver treatment is combined with other antimicrobial methods such as UV light, copper ions, or oxidizers, a synergistic effect is observed, that is bacterial growth is inhibited more by treatment with silver and an additional antimicrobial method than would be expected if the inhibition effects of silver and that additional antimicrobial method were summed (Silvestry-Rodriguez et al., 2007). Because silver can inflict a fair amount of damage to the cell only once it gains access to the cytoplasm, it is believed that if some other antimicrobial method can give silver ions access to the cytoplasm sooner than if silver ions were working alone, a synergistic effect of the two methods would be observed (Silvestry-Rodriguez et al., 2007). Silver can be administered to cells in a various number of ways. Silver salts such as silver nitrate (AgNO3) are effective at providing a large quantity of silver ions all at once. Because silver binds to thiol groups, it has been proposed that although one of the antimicrobial mechanisms of Ag+ is binding to sulfur-containing compounds, thiol-containing compounds such as proteins with cysteine residues can also serve to absorb the silver ions and neutralize their antibacterial activity by preventing the silver ions from attacking DNA (Liau et al., 1997). For this reason, prolonged antimicrobial activity from silver is best achieved by continuously releasing a moderate amount of silver ions. Silver zeolite is also a commonly used form of antibacterial silver. 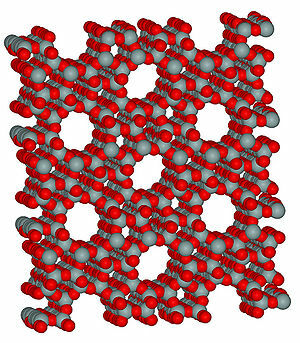 Zeolite (Figure 7) is a porous matrix of sodium aluminosilicate that can bind a large amount of silver ions in its micropores (Monteiro et al., 2009). Silver ions are released from the zeolite matrix by exchange with other cations in solution and the amount released is proportional to the concentration of other cations in the solution (Breck, 1974 as cited in Kawahara et al., 2000). Kawahara et al., (2000) ran experiments to test the antimicrobial properties of silver zeolite in anaerobic conditions. Minimum inhibitory concentration (MIC) assays were performed using silver zeolite, and it was found that depending on the species tested, the minimum inhibitory concentrations of silver zeolite ranged from 256 to 2048 µg/ml, which corresponded to a range of 4.8 to 38.4 µg/ml of Ag+. Because zeolite is already used in some toothpastes as a polishing material and the lack of silver toxicity to humans at concentrations such as those found in the MIC assays, the authors believed that silver zeolite would be a good compound to incorporate into dental materials, even those used in anaerobic conditions such as in periodontal pockets (Kawahara et al., 2000). Figure 9. Different sizes of silver nanoparticles. 7-nm (a), 29-nm (b), and 89-nm (c) diameter nanoparticles were able to be synthesized using silver nitrate and gallic acid and by varying pH or UV light exposure. Images were captured using transmission electron microscopy (Martinez-Castanon et al., 2008). Silver nanoparticles have been heavily studied as antimicrobial materials. Their simple synthesis (Figure 8) and highly effective observed antibacterial activity make them a very attractive form of silver administration. Martinez-Castanon et al. (2008) studied the effect of nanoparticle size on antibacterial effectiveness. To begin, nanoparticles with 7-nm, 29-nm, and 89-nm diameters were synthesized. The syntheses of the three different sized nanoparticles all used silver nitrate as a supply of silver ions and gallic acid as a reducing and stabilizing agent. The different sizes were produced by simply either altering the pH or irradiating the solutions with UV light. Transmission electron microscopy was used in the characterization of the nanoparticles to determine their average sizes (Figure 9). Once the sizes of the nanoparticles were confirmed, MIC assays were performed on E. coli and S. aureus using the synthesized nanoparticles. The results of the MIC assays showed that smaller nanoparticles have more of an inhibitory effect than larger nanoparticles and that S. aureus is more resistant to silver nanoparticles than E. coli. The result that S. aureus is more resistant than E. coli to silver agrees with findings obtained by Kawaharaet al. (2000). Figure 8. 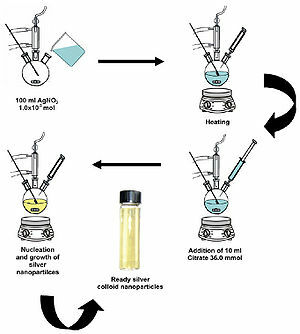 Schematic illustration of the production of silver nanoparticles by reducing silver nitrate with citrate (Monteiro et al., 2009). Gallic acid was used as a control in the MIC assays (Figure 10); the silver nanoparticles were added to cell cultures in the MIC assays in the same solution in which they were produced, so it needed to be tested whether or not the gallic acid produced as a byproduct of the nanoparticle synthesis would have an effect on cell growth. 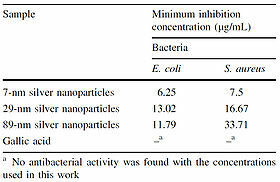 For the MIC assay using E. coli, the difference between the minimum inhibitory concentration of the 29-nm nanoparticles and that of the 89-nm nanoparticles was statistically insignificant (Figure 10). The increased antimicrobial activity of the smaller nanoparticles could be due to the fact that smaller particles have an easier time getting through the cell membrane and cell wall and that relative to larger nanoparticles, smaller particles have a greater surface area to volume ratio (Martinez-Castanon et al., 2008). The greater surface area to volume ratio of smaller nanoparticles means that per unit mass of silver, the smaller nanoparticles have more silver atoms in contact with the solution than do larger nanoparticles. For smaller nanoparticles, this means that more of the silver atoms contained in the nanoparticle are able to take part in cell destruction processes. If only the outer layer of silver atoms of a silver nanoparticle are able to be ionized to silver ions, then a few large nanoparticles should produce less silver ions than a lot of small nanoparticles. Because silver ions are what impart antibacterial properties to a given silver-containing material, it makes sense that smaller silver nanoparticles have more antimicrobial effectiveness than larger silver nanoparticles. Figure 10. Minimum inhibitory concentrations of Ag nanoparticles. Smaller nanoparticles have greater antibacterial activity. The concentration difference between 29-nm and 89-nm nanoparticles for E. coliwas not significant (Martinez-Castanon et al., 2008). In addition to size, nanoparticle shape also plays a role in antibacterial activity. Pal et al. 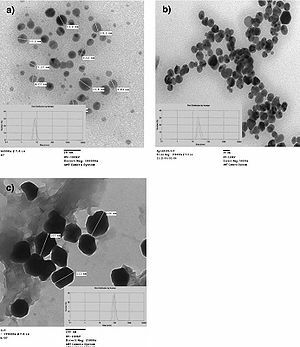 (2007) synthesized spherical, rod-shaped, and triangular silver nanoparticles and tested each of them for antimicrobial activity using E. coli. E. coli was streaked onto agar plates, and 1 µg, 12.5 µg, 50 µg, or 100 µg of each of the three types of synthesized silver nanoparticles as well as AgNO3 were added to the streaked plates. The number of colonies that formed for each of the conditions was counted and graphs relating the number of formed colonies and silver concentration for each of the four types of silver tested were constructed (Figure 11). It was determined that the order of most antibacterial to least antibacterial of the four silver-containing compounds was triangular, spherical, rod-shaped, and AgNO3. This order of antibacterial activity is explained by the different types of facets on the nanoparticles. The triangular nanoparticles had more active facets (electron dense facets) than did the spherical nanoparticles. The spherical nanoparticles, which weren’t perfectly spherical, had more active facets than the rod-shaped nanoparticles (Pal et al., 2007). Thus, shape does have an effect on antibacterial activity of silver nanoparticles and nanoparticles with more active facets have more antibacterial activity. Figure 11. Antibacterial ability of silver nanoparticles is related to nanoparticle shape. A) Agar plates were streaked with 107 colony forming units/ml of E. coli and incubated with silver in different forms (either Ag+ (AgNO3), silver rod nanoparticles, spherical nanoparticles, or triangular nanoparticles). Each type of silver was administered in four quantities, 1 µg (a), 12.5 µg (b), 50 µg (c), and 100 µg (d). B) log(1 + # of colonies formed) was plotted against concentration of silver (µg) for each of the types of silver administered. R2 values indicate the fit of the plot to a first-order exponential decay curve (Pal et al., 2007). Novel wound dressings have been developed that use silver to help prevent wound infections. Silver nanoparticles are incorporated into the wound dressing, and the silver-enhanced wound dressings were found in vitro to consistently kill Pseudomonas aeruginosa cultures entirely and kill Staphylococcus aureus cultures with >99.99% efficiency (Ong et al., 2008). In mice, the silver-enhanced wound dressings were also found to reduce mortality from Pseudomonas aeruginosa wound infections from 90% to 14.3% (Ong et al., 2008). Among hospital patients that require ventilator-assisted breating, ventilator-associated pneumonia is the most common illness (Olson et al., 2002). Endotracheal tubes are used by patients needing ventilator-assisted breathing. Silver coatings on the inside of endotracheal tubes have been shown to delay the appearance of bacteria on the insides of these tubes, and subjects that used the silver-coated tubes also showed decreased lung colonization by Pseudomonas aeruginosa (Olson et al., 2002). Kollef et al. (2008) showed that silver-coated endotracheal tubes actually do reduce the incidence or increase the onset time of ventilator-associated pneumonia in patients using a ventilator. Figure 13. Scanning electron micrograph showing silver nanoparticles on cotton fibers and table showing antimicrobial efficacy of silver-implemented cotton after repeated laundering cycles. 54 ppm silver nanoparticle solutions were applied to cotton fibers and a binder was then applied to the cotton to help retain silver nanoparticles on the material (El-Rafie et al., 2010). Studies have examined the antibacterial properties of surgical masks coated with silver nanoparticles (Li et al., 2006). Nanoparticle coated masks were capable of a 100% reduction in viable E. coli and S. aureus cells after incubation. Additionally, the study reported no signs of skin irritation in any of the persons wearing the masks (Li et al., 2006). 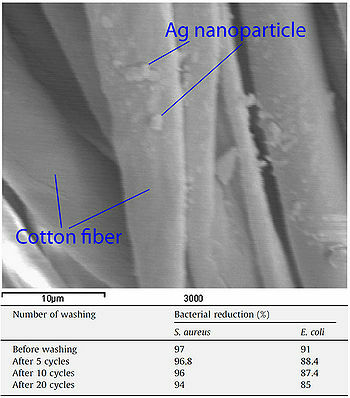 Silver nanoparticles have been used to impart antimicrobial activity to cotton fibers. Cotton samples were immersed in silver nanoparticle solutions and then subjected to a curing process to allow the nanoparticles to adhere to the cotton (El-Rafie et al., 2010). A chemical binder was then applied to the fabric to help maintain nanoparticle-cotton binding. Cotton samples prepared in this manner were able to reduce S. aureus and E. coli cell counts by 97% and 91% respectively. Even after subjecting the fabric to 20 laundry cycles, the cotton samples were still able to reduce S. aureus and E. coli cell counts by 94% and 85% respectively (Figure 13). Cotton prepared in this manner could be used by individuals working in the medical field or those who often work with microbes to prevent the spread of infectious bacteria (El-Rafie et al., 2010). Although chlorine has long been used as the primary drinking water disinfectant, it has been shown that the chlorination of water can lead to the formation of many hazardous compounds (Moudgal et al., 2000). Based on its low known toxicity to humans, silver has been suggested as a possible disinfectant of drinking water (Silvestry-Rodriguez et al., 2007). Water recycling systems on the Mir space station and NASA shuttles have used silver as an effective water disinfectant, and in the United States, faucet-mounted and pitcher home water purification units contain carbon filters that are supplemented with silver (Silvestry-Rodriguez et al., 2007). AGC Flat Glass Europe has developed a glass with antimicrobial properties (AGC: Antibacterial glass). Silver ions incorporated into the glass are responsible for the antimicrobial activity. The company reports that 99.9% of bacteria that come in contact with the surface of the glass are killed. The glass was produced to help prevent the spread of pathogens in a hospital setting. It could also be used to maintain the integrity of sterile workspaces. Various types of food packaging have been supplemented with silver-containing compounds to deter microbial growth and extend product shelf life. Some of these packaging types include bulk food storage containers, paperboard cartons, plastic or paper food wraps, and milk containers (Appendini and Hotchkiss, 2002). Silver zeolite is the silver-containing compound used in food packaging (Appendini and Hotchkiss, 2002). Although few silver-containing compounds are approved by the FDA for direct food contact, silver-incorporated food packaging is quite widespread in Japan (Appendini and Hotchkiss, 2002). 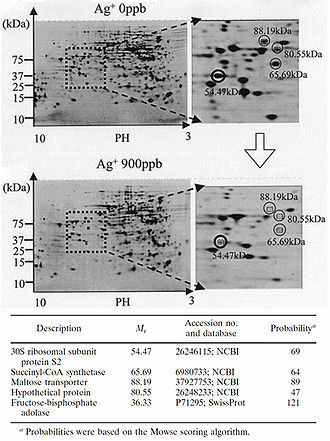 Recent studies have revealed that the antimicrobial properties of silver are due to its ionized form, Ag+, and its ability to cause damage to cells by interacting with thiol-containing proteins and DNA. These effects have been visualized (Feng et al., 2000) as well as quantified through many experiments. Silver nanoparticles are a form of silver of particular interest because of their easy production, high antimicrobial activity, and ability to be incorporated into a diverse range of products. With the ever increasing number of antibiotic-resistant strains of bacteria and silver’s low toxicity to humans, the use of silver as an antimicrobial agent is an exciting topic with a great deal of relevance to many fields of study and industry. Can CS be generated in a plastic container rather than a glass jar? You can make CS in a plastic container but run the risk of leeching plastic. Use glass for the best results. Ions, not particles, make silver toxic to bacteria.